This Monday, a federal judge in California temporarily blocked the Trump Administration’s policy of returning Central American asylum seekers to Tijuana and Mexicali as they wait for their court hearings. He also ordered for those immigrants who have already had their initial court date to be immediately returned to the United States. The measure will take effect this Friday, April 12th, at 5:00 p.m. Pacific time. 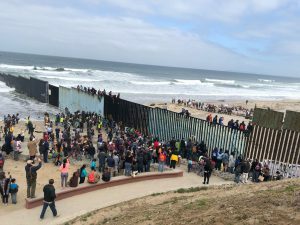 According to Judge Richard Seeborg’s order, some of the 1,105 Central American migrants currently waiting in Tijuana, Mexicali, and Ciudad Juarez under the Migrant Protection Protocols (better known as “Remain in Mexico”) would have to start being returned at that time. The project, which was unilaterally implemented in January, was accepted by Mexico’s President Andres Manuel Lopez Obrador for humanitarian reasons. As of this week, the MPP had returned 716 migrants to Tijuana, 188 to Mexicali, and 201 to Juarez, many of them families with children. The ruling stems from a lawsuit filed by U.S. advocacy groups. The lawsuit was filed by the ACLU, the Southern Poverty Law Center, and the Center for Gender and Refugee Studies. They argued that the MPP was being used to deter people from seeking asylum in the U.S. Some of the first migrants returned to Tijuana had a San Diego court changed the immigration hearing dates, moving them ahead six days. Since there was no way to inform the asylum seekers of the change, they missed their hearings and were now facing deportation proceedings as a result. The suit was filed in March on behalf of 11 asylum seekers and organizational plaintiffs Innovation Law Lab, the Central American Resource Center of Northern California, Centro Legal de la Raza, the University of San Francisco School of Law Immigration and Deportation Defense Clinic, Al Otro Lado, and the Tahirih Justice Center. The lawsuit further argues that the policy violates the Immigration and Nationality Act, the Administrative Procedure Act and reminded the court that the U.S. is bound by international human rights protocols not to return people to dangerous countries. Through Press Secretary Sarah Sanders, the White House responded that “the United States and Mexico are collaborating on this program.” However, Mexico’s Ministry of Foreign Affairs and later the director of its National Immigration Institute, Tonatiuh Guillen, stated that this program was unilaterally decided by the United States, and that it was only for humanitarian reasons that Mexico accepted having the asylum seekers the Trump Administration sent back to wait in Mexico without any agreement.